The night race I ran with my heart – literally and figuratively – and achieved sweet success. 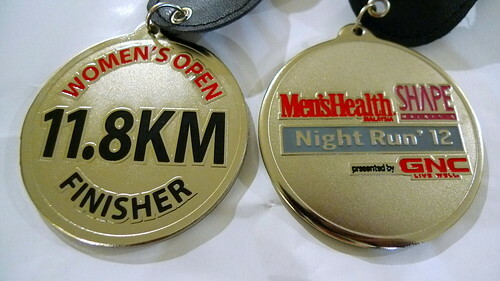 Talk to any casual runner who has ever done the women’s Shape or Men’s Health Night Run in Malaysia (they are both one and the same) and you will probably hear more about how awesome the free goodie bag is rather than how challenging the race course is. Granted, the goodie bag did weigh a ton and offered more stuff than I had ever seen from any other racing event, but that is not to say the race itself did not leave a lasting impression on me. In fact, it was my best race performance to date. The Shape Night Run 2012 was held in the administrative capital of Putrajaya, and the flagoff area was specifically in front of the Palace of Justice in Precinct 3. This is officially my 2nd night race, the first one being the Energizer Night Run in 2011. There were 2 categories, the 5km fun run and the 11.8km. I ran the longer course, naturally – having a timing chip is my motivation to do well! This year, some 6,500 participants entered the race and I must agree with runwitme – it is by far the most fun racing event in Malaysia I have ever witnessed and experienced. Nom nom nom… revenge of the cereal killer. We arrived in Putrajaya close to 7pm. After we had parked and gotten out of the car, I noticed a fellow runner casually smoking a cigarette. Some runners do short runs to warm up, this guy inhales tobacco smoke. Lungs of steel, dude! We make our way to ground zero and it was so happening – there was a stage in the middle with loud music blasting and dancers and a fitness coach prancing away. They were inviting the crowd to join them in some warm up sessions, but after I saw how much jumping was involved in their techniques, I opted not to follow them and did my own set. There were also many booths offering free energy drinks, cereals, and yogurt, while others sold sports clothing and shoes at discounted prices. Honestly, you need to slip a credit card somewhere in your running shorts to these events because so many things go on offer then, enticing tired and aspiring runners with all manner of compression wear and specialized running shoes and gadgets. I started sampling energy drinks, left, right and center, and then stumbled upon a cereal booth where they were dishing up cereal flakes in small paper cups and pouring milk on them. I got carried away and helped myself to a bowl, a decision which I would later regret. Did anyone lose their rooster? After stuffing myself, I decided it was time to plant myself in the race pen where the 11.8km runners were beginning to congregate and get ready. As I was stretching, from the corner of my eye I noticed a peculiar figure walking amongst the crowd of people: it was, of course, a giant black rooster. Or rather, a guy dressed up as the mascot for Nandos. The chicken was accompanied by his sidekicks dressed in afro wigs who were offering chicken samples to the runners. Seriously. Extra hot flavored peri peri chicken pieces for people who were going to be running. Surprisingly enough, a few runners couldn’t resist the free samples. Malaysians. I guess we’re forever hungry. The race was flagged off at precisely at 8pm – and I only knew because I heard a gun shot in the distant. It took about 5 minutes for me to reach the start line, just before I turned on my Endomondo app on my phone and started my Garmin watch (talk about being data-obsessive). It was on! I started out easy at a leisure pace to get warmed up while a large crowd of runners went ballistic and breezed me by. The first 2km was a straight flat road and we passed by many government buildings that were lit up and looked majestic in the sundown sky. This was a particularly easy and flat stretch and the wind was blowing so it was nice and cool. I noticed a mother and her teenage son (I say he had to be about 13) running together. I overheard the mother asking her son (who wore a t-shirt which said “Triathlete? So what!” at the back) “Dear, would you like to get rid of your water bottle?” – to which the son shook his head (which sane runner wouldn’t?). I would later meet them again towards the last few kilometers where I played catch up with them. That mother was strong! Ah yes, it was during the first kilometer that my stomach experienced a sharp pain on my right side. I knew this pain too well and it’s the kind I get when I’ve started running too soon after eating. What could have caused it? It’s been hours since I had my last proper meal. Then I remembered, my God, it was that free cereal I had, all angry and vengeful because I hadn’t given it time to properly digest! Did I mention the stuff was made of high fibre? Lord. I had to grit through the pain and run it off until it eventually and thankfully subsided. Note to self: don’t eat free food before a race! After the first 2km we reached and crossed a bridge and the incline started to pick up. You could see a lot of people slowing down to a walk to deal with the gradual change of road elevation. This road ran 500m before you see the Putrajaya International Convention Center looming at the end of the T-junction, at which we turned left and hit the first water station at km3. People are starting to slow down here – can you tell? The route from then onwards was pretty much dull as we ran along the huge man-made lake in Putrajaya. Except for a view of another lit-up bridge at just after km6, there was nothing to see but highway lamps and a few sparse apartment buildings. I gave the apartments a glance to see if there was anyone watching us from their windows. I guess I was surprised to see that not a soul was seen at those windows – the occupants must not have known there was a race going on. Putrajaya people need to get a clue. There was a lot of hills in this particular route which was most evident as we made turn after turn at highway exits that went uphill and then downhill. I was surprised to later learn from our Garmin data that the elevation gain in Putrajaya was actually more than Bukit Jalil! I also encountered a runner who had to double back and pick up the D-tag which had just fallen off his shoe, almost near to me. I don’t know how anyone could lose their timing tags like that, given that it came with adhesive and a clip to secure the loop in place. Since I knew I was going to run for more than 1 hour, I brought some gummy candy. I stuffed them (saran-wrapped first, of course) inside the little inner pocket of my tights (where you’d normally keep a small locker key). At the water station where people gulped down their water I was busy groping myself for hidden candy (hehe). I had 60% of my sweets at km6, then the rest at km9 (I brought 1 serving totaling 130 calories – a typical energy gel pack contains 100 calories). I’m not a fan of energy gels, I think candies are more fun and easier to eat. This is the first time I am racing with food and I am glad that I did – the sugars helped boost up my depleting my energy levels. Remember: 30-60g of carbohydrates for every 45 minutes of run lasting more than one hour! As I predicted, the sweets came in real handy: no isotonic drinks were to be seen in sight at the water stations. I do think that the organizers have prepared them, but they’re all consumed by faster runners who have stopped by much earlier, leaving us turtles with plain ol’ water. Throughout the run I made sure to stay on the road all the way and not sneak up on the sidewalk pavement like some of the other runners. I do this because of two reasons: 1) it is a road race, not a sidewalk race, and 2) the pavement may not be even, so rather than risk tripping on a loose or uneven brick and injuring yourself, better stick with the roads. Even if it means a longer route (which may explained why my Garmin and Endomondo clocked more than 12km). I was doing consistent paces for all my kilometers so far and I really wanted to finish within the time that I had set for myself. The kilometers racked up pretty smoothly with no incident on my end. I pushed on and eventually caught up with the mother-son couple I had seen earlier in the beginning. I overtook them and vowed to keep the pace until I saw the finish line. At km10 I met with a couple of race marshals giving out green fluorescent ribbons which I suppose was a physical checkpoint evidence of some kind. I grabbed one and wore it around my neck for the rest of the distance. By this time my 2nd right toe was feeling like it was going to lose a toe nail and I felt the becoming of a blister on my left big toe. Oh dear, did I make a mistake in wearing new socks that night? I think so. Again, no trying new things on race day! Ironically the one day I race in my Kinvara 2s with socks, I get a blister. Pfft. Pretty soon I see the finish line in sight! I see my cameraman, he was literally in my path and he shoots some video of me. I wave, grinning because in all my exhaustion I really was having a lot of fun. As I reach the end of the race, we were directed to enter specific lanes for men and women. I was impatient with the ladies in front of me, so I ran on the men’s lane for a bit and overtook them so that I could finish strong. And I did! My official time for the race was 1:30:26, right smack on my target time! As icing on top, I also achieved my best 10k time of 1:13 (runnerd mode on). Panting and feeling exhilarated, I slowed down to a walk as I was handed a piece of card paper by a lady race marshal at the finish line who congratulated me. On it the number “249” was scribbled, which I guessed meant that I was the 249th woman in my category to complete the race. I was handed a medal and then ushered to get drinks and the goodie bag. Later I found out that 944 other women ran with me in my category. Later on as I met up with friends, a few exclaimed how lucky I was to have gotten a medal. I asked why? They said that each category had limited medals, and for the women’s open category specifically only 300 were prepared, whereas the veteran categories had something like 100. Wow, I couldn’t believe it, not only did I achieve a personal best, but I had actually gotten a medal when allocation was limited! I was very happy. My glorious precious medal…! Thank you all for your support. After the race I stuck around to take photos with more friends and started talking to the compression wear sales people about the benefits of wearing such clothing for running (boy are they pricey). We had more drinks and then stayed till the crowd tapered and our car was the only one left in the car park lot. Then we left to grab a very late dinner. All in all the Shape Night Run is by far my most favorite run – the race was moderately sized and cosy but big enough to have created a party-like atmosphere. The goodie bag stash was good, and I achieved my best race timings (thanks in part to the interval trainings I had been incorporating into my weekly runs). Would I run Shape again? Absolutely – what a great race this was! Great organizers, everything went smoothly, from flag-off, freebies, fuel, emergency treatment, to medal distribution. Putrajaya, I am not done with you yet. See you for BSN Putrajaya Night Marathon in October – where I will run my first half marathon! God willing. 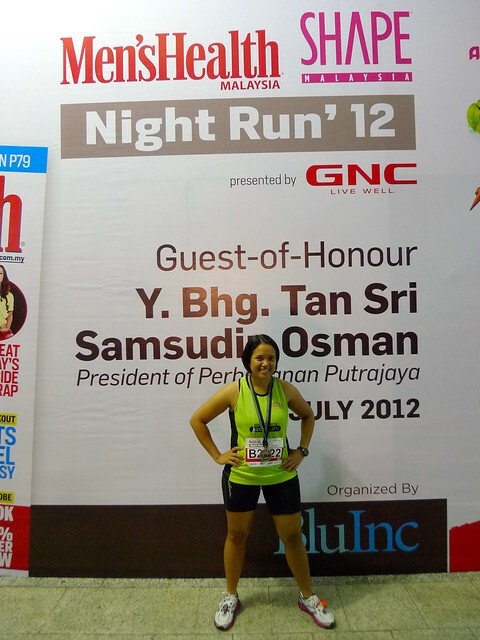 Video: See me in action at Shape Night Run 2012! @runfairyrun @nannoor @na_omey all the best to you guys too! @runfairyrun congrats & well done! oh yaaa @runfairyrun juga ikut #ShapeRunKL yah. congrats! @runfairyrun how was your Shape Run? @runfairyrun that's great!! Will look out for the post! Hv a happy Tuesday! Good job & well done on your Shape run! Sangat-sangat terbaek! ruginya tak dapat kejar ayam raksasa tu!!! !